Order Online or Purchase from your local independent bookstore. Demonstrating the principle that soulfulness at work is a way of being and doing, this guide provides new perspectives on the qualities of leadership. Three main sections elaborate on the themes of choosing the path, staying on track, and persevering to the end. Drawing from interviews with outstanding leaders, including Tom and Kate Chappell, the founders of Tom's of Maine; Bob Glassman, co-chairman of Wainwright Bank & Trust; Desmond Tutu; and The Edge of rock band U2, and supported with guided questions in each section, this book is an essential addition to the bookshelf of anyone who wants to lead with soul. In an environment where leaders are rewarded for their drive, decisiveness, productivity, and long work hours, the spiritual well-being of a leader may get short shrift, and harm can come to both the leader and the organization this individual serves. Challenging the assumptions that effective leaders must sell their souls, cut corners, cook the books, and let go of their vision, a new model of spiritual leadership is offered. Teachers, parents, committee chair leaders, and other individuals in organizations of any size are exhorted to aim higher and lead with soul in any sphere, large or small. "Today's global community desperately needs leaders with soul. Margaret Benefiel's groundbreaking book meets that need beautifully, by teaching principles of soulful leadership, illustrated with stories of real leaders who practice them. Required reading." "The Soul of a Leader breaks the mould of leadership books. Both practical and inspiring, Margaret Benefiel's book lays out a path we can follow to make a real difference in whatever world we land. Benefiel helps me to dare to dream, battle for my soul, and break through the barriers that keep me from succeeding." "Margaret Benefiel has gone right to the source – leaders who have chosen a deeper, more soulful path to building better organizations and a better society. Their stories are woven together to provide inspiring lessons for all of us who seek to build depth and spirit at work." "The Soul of a Leader touched the soul of this reader. With her stories of real people struggling to lead with soul in a variety of workplaces, Margaret Benefiel guides others through the important steps of becoming a soulful leader. She does not minimize the difficulties, but makes the journey possible for all committed to this path." "No organizational leader reading this book can help but find both inspiration and practical, concrete help for nurturing their own souls and the soul of their organization. The author's deep organizational and spiritual background provides a realistic yet visionary ground for attending the inner life of leaders and the workers of their organizations, in close relation to the practical outer needs of organizational life. The book paves the way for soul-full personal and organizational life that brings the fruits of integrity, shared values, mutual respect, and success, illustrated through many inspiring stories of leaders and the transformation of their organizations." "This book is a must read for anyone who ever considered grounding their lives and work in love and service to pursue a higher calling that just might change the world. Margaret Benefiel is one of the most creative thinkers on spiritual leadership alive today and The Soul of a Leader is an accessible taste of her brilliance. Like a masterful conductor, she combines theology with science and presents a practical guide filled with case studies and everyday examples that we can all follow in our own spiritual journey." "For the new generation of leaders who are replacing the Baby Boomers, please read this engaging book so you can take over leadership with soul and spirit and heart! Margaret gives you real-life examples and practical steps to take in your own setting and create the kind of organization you envision!" "Margaret Benefiel has written a book that is powerfully inspirational and eminently practical. Through the use of stories culled from interviews with leaders with soul, she provides excellent guidance as to how to lead with soul." "Benefiel's gentle yet incisive insights remind us all that leadership at its core is grounded in the soul. Her collection of human stories illustrate various themes that will help leaders nourish their soul and strengthen their leadership." "Something is changing dramatically in the world of organizational leadership. No longer is it just enough to meet quarterly expectations and grow the bottom line. Leaders themselves are finding their soul and wanting to grow spiritually in a way that is integrated with their work and family life. And as they grow personally, they begin to feel called to nurture the soul formation of those who work with them in the organizations they lead. Margaret Benefiel's brilliant book, The Soul of a Leader, provides an inspirational and practical guide to leading with soul. This will become an important reference book for those pioneers who are leading from the deepest core of who they are, and who are committed to making a positive difference in the world." Soul at Work describes the way organizations do business. Soul in the workplace is not a theological abstraction, but a way of being and doing. Each of the organizations that Benefiel profiles in this lively and informative book describes the profound role that awareness of soul, or spirituality, can play in leadership and organizational life. Divided into three parts, the book looks at the role of individuals in nurturing soul, the organizational reality by which soul is manifest, and the process by which the tension between individual and organization is managed. It is for managers, workers, organization specialists, church groups and anyone involved in the transformation of organizational life. It is for everyone who suspects that there is more to business than the bottom line. "This book is a must-read for anyone who wants the workplace to become more life-giving for all concerned." "This book advances the 'spirituality and work' movement to a next level of practicality and social value. It's a joy to read and a source of inspiration for all those looking to glimpse into a life affirming future." "Evocative, challenging, and compelling. This book is a gift to the imagination of organizations and those who work in them." "This wise little book invites the reader into a user friendly conversation that contains memorable, grounded illustrations drawn from contemporary organizational life, focuses the reader on spiritual essentials, and allows the reader (or teacher) to probe at any depth that might be desired." "Both students and managers will find this book practical, understandable, and inspirational." "What is exceptional about this book is Margaret Benefiel’s ability to wed the pragmatic, realistic, and often challenging aspects of creating spirituality in the workplace with the deep wisdom of spiritual traditions passed on for generations. Soul at Work is a creative and most welcome synthesis." "I couldn't put this book down till I had read it all the way through. I found practical tools and techniques and real-life stories to show me the way to incorporate my spirit in my work every day. Your copy will definitely be dog-eared at the best practices and tools." "This book is a gift to any organizational leaders who care about their own souls and the souls of the organizations they lead." "Soul at Work is destined to take its place in the business, ethics, and values literature right next to the long-time bestseller by Bolman and Deal, Leading With Soul. Both wise and clear, the book includes examples from health care and the non-profit sector as well as a giant corporation which has quickly become its industry leader." 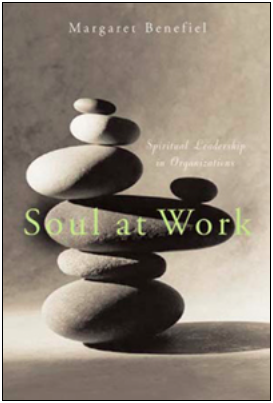 "Filled with practical, workable suggestions, Soul at Work provides a window into the lives and organizations of people who have found many practical benefits in developing the spiritual core of both themselves and their workplace." "In Soul at Work, Margaret Benefiel has captured a diverse set of real world examples of the challenges that today's leadership faces, and how to deal with them on both an organizational and personal level. I know that her writing will be helpful to many as it has been for me, to provide a calibration of my own personal spiritual leadership." "Soul at Work avoids the ditch on either side of the road traveled by those who write about spirituality and organizational life. It neither casually affirms leaders who have co-opted religious language while continuing business-as-usual in every other regard, nor does it figuratively shake its finger at leaders in the inevitably imperfect world of organizational life. We are invited to travel into the very center of our lives at work, and to risk venturing the journey as whole persons, accompanied by a trustworthy guide who knows the way." Margaret Benefiel and Geraldine Holton, eds. "As the ministry of spiritual direction grows and evolves, so too does that of supervision. Every spiritual director has an ethical commitment and obligation to maintain an ongoing supervisory relationship that supports and nurtures his or her growth, identity, ministry and service.... The Soul of Supervision is a wonderful addition to the growing library of resources about training, formation, and ongoing support for spiritual directors."